Belotero Balance is an ideal choice to soften and smooth moderate-to-severe etched-in lines and wrinkles for more of a finishing touch. Restore your natural, finished look with BELOTERO BALANCE injectable gel. This hyaluronic acid (HA) smoothes moderate-to-severe etched-in lines and wrinkles such as vertical lip lines above and around the lips. By integrating within in your skin’s tissue, BELOTERO BALANCE maintains natural movement and facial expressions for a look that feels natural to the touch. Help take your wrinkles all the way to smooth with BELOTERO BALANCE. Treatments: BELOTERO BALANCE is a prescription injection that is approved to temporarily smooth out and fill in moderate to- severe nasolabial folds (the folds or wrinkles that go from the side of the nose to the corner of the mouth). When wrinkle or fold is treated to full correction. Individual results may vary. BELOTERO BALANCE integrates directly into the skin, enhancing your appearance with minimal downtime. Discover how to help take your wrinkles all the way to smooth with Belotero Balance. Only Belotero Balance is created using a proprietary technology, resulting in Cohesive Polydensified Matrix (CPM). This gel is very cohesive which allows to evenly blend into your skin, providing a natural looking result. 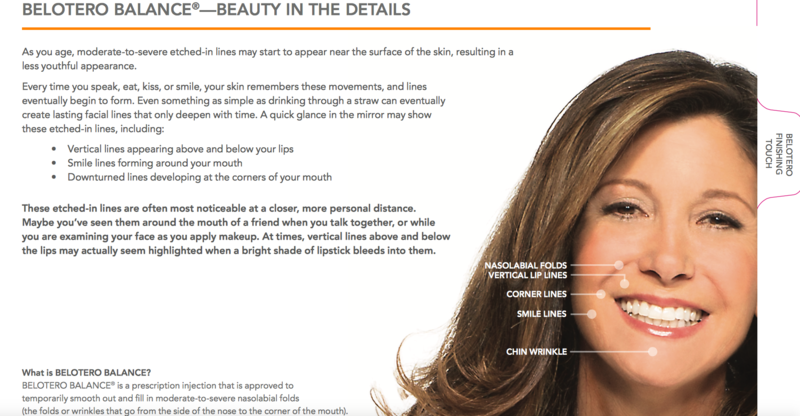 While some fillers are designed to rebuild facial structure and volume, Belotero Balance takes a more targeted approach, specifically treating moderate-to-severe etched-in lines and wrinkles, such as vertical lip lines. Belotero Balance treatments are a quick in-office procedure. Treatments are usually completed in about 30 minutes. Because little to no downtime is required, it’s likely you’ll be free to return to your regular daily routine right afterwards. And because the results are immediate, you can leave the office looking more refreshed. For detailed information visit www.radiesse.com and www.belotero.com. BELOTERO BALANCE® is a prescription injection that is approved to temporarily smooth out and ll in moderate- to-severe nasolabial folds (the folds or wrinkles that go from the side of the nose to the corner of the mouth). One of the risks with using these products is unintentional injection into a blood vessel. The chances of this happening are very small, but if it does happen, the complications can be serious, and may be permanent. These complications, which have been reported for facial injections, can include vision abnormalities, blindness, stroke, temporary scabs, or permanent scarring of the skin. If you have changes in your vision, signs of a stroke (including sudden dif culty speaking, numbness or weakness in your face, arms, or legs, dif culty walking, face drooping, severe headache, dizziness, or confusion), white appearance of the skin, or unusual pain during or shortly after treatment, you should notify your health care practitioner immediately. As with all events that involve an injection through the skin, there is a risk of infection. Laser treatments or chemical peels or any other treatments that affect the skin can increase the risk of infection. Do not use BELOTERO BALANCE if you have a skin in ammation or a skin infection. Do not use until the infection is healed. alcoholic beveragesExposure to any of the above can cause temporary redness, swelling, and/or itching at the injection site. It is not known how BELOTERO BALANCE will work in areas of the face other than the smile lines. It is not known how BELOTERO BALANCE will work in women who are pregnant or breastfeeding or people who are less than 21 years of age. Tell your doctor if you have a skin reaction like cold sores, cysts, pimples, rashes, hives, or an infection. Treatment with BELOTERO BALANCE should be delayed until the reaction goes away. The most common local side effects seen with BELOTERO BALANCE were swelling, bruising, redness, hardening of the skin, pain, altered color, or itching. Other side effects that have occurred with BELOTERO BALANCE include headache, swelling of the side of the nose, moderate cold sore, lip numbness, and lip dryness. Side effects were often mild to moderate and often resolved within 7 days.